White 11 oz. budget mug made of ironstone ceramic. Features a glossy exterior/interior and a large C-handle. With an overall size of 4-13/16"w x 3-3/4"h x 3 1/4" diameter, it reaches its 11 oz. capacity when filled to the rim. Good value. 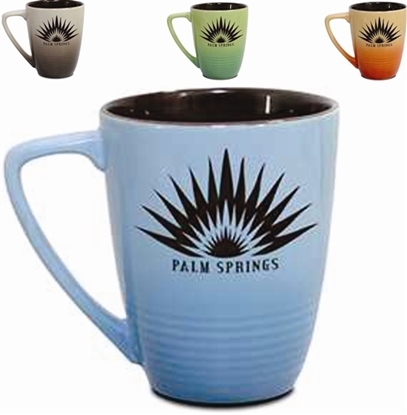 To stand out again and again, proudly display your name or message on these ever-popular, custom printed ceramic 11 Oz. coffee mugs. Also available filled with candy or coffee! Hand wash for mugs is recommended. Microwaveable. Bulk packed. 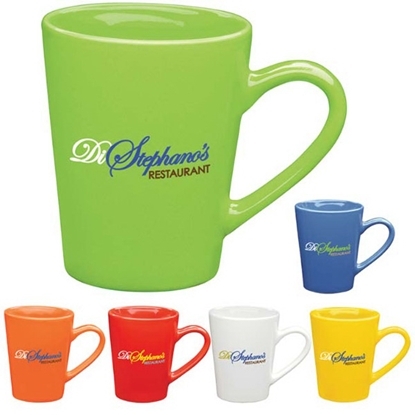 Promote your business or company logo with this customized Economy Stoneware drinking cup. This coffee cup is an original eco-friendly alternative to those foam & plastic cups. 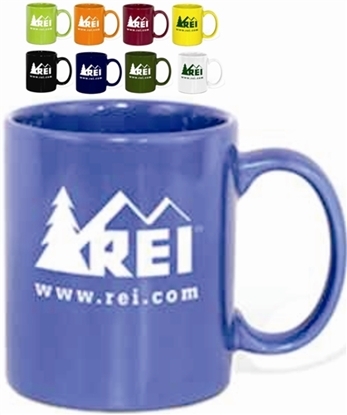 Best-selling reusable economical 11oz ironstone C-handle coffee mug. Available with up to 5 color screened imprint. Add gold or platinum accents for maximum perceived value. This ceramic mug is a great hot or cold beverage holder for office or home coffee or tea drinking. 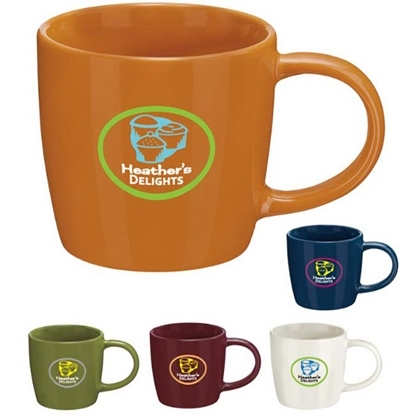 Your logo will look so good on this fashionable mug, you'll almost forget it's a coffee cup! 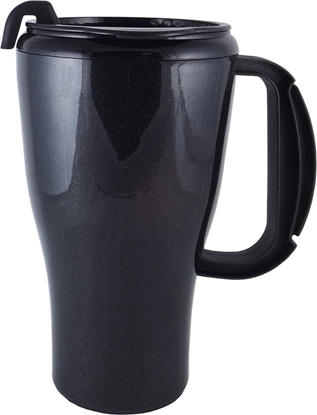 Our Tailored Lightweight Travel Mug is made in the USA and features black plastic double wall with foam insulation. The trim plastic coffee cup design fits in most cup holders. At 6" H x 3 3/8" D, this eco-friendly stein is BPA free. Matching black plastic no-spill vent lid, comfort handle for easy grip. Not microwave- or dishwasher-safe. Ideal for design-themed businesses, sports leagues, government agencies and nonprofits. 12 oz. two-tone mug with a colored handle and halo. It has a glossy exterior/interior and a large C-handlep. Measuring 3 1/4" dia x 4" h x 4 3/4" w, it reaches its 12 oz. capacity when filled to the rim. Handles and halos are hand painted, so each mug may vary. We do our best to match imprint to halo and handle colors. However, exact matches are not always possible. Good value. Our 16 oz. 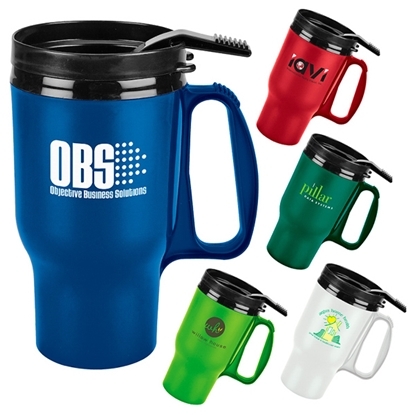 Omega Mug with Slider Lid will be a hit anywhere anyone gets thirsty! It's made in the USA of eco-friendly polypropylene material. This handy 6 1/2" H x 4" D tumbler features an easy-grip hadle and bold high-gloss color PP outer wall with white PP liner. It's top rack dishwasher safe and has a matching color spill-resistant slider lid. BPA free. Not microwave safe. Have your logo silkscreened for a great event giveaway. Ideal for auto dealerships and outdoor festivals! 16 oz. Easy-grip handle, Bold high gloss color PP outer wall and handle, Black PP liner, Double wall insulation, Matching color spill- resistant slider lid, Made in the USA, Top rack dishwasher safe, BPA free, Not microwave safe. Item size: 6 1/2"H x 4" Dia. 16 oz. Double wall insulation, Classic white plastic coffee cup, Contrasting bold color silicone texture grip center band, Matching color plastic twist-on lid, BPA free, Not microwave or dishwasher safe. 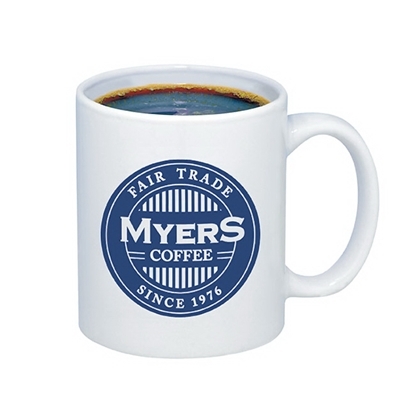 Item size: 7"H x 3 3/4"W.
Budget Mug - 11 oz. Ironstone Ceramic mug with Glossy exterior/interior. Large C-handle. 11 oz. capacity when filled to the rim. Available in a variety of colors. Mug dimensions: 4 1/2" W x 3 3/4" H.
16 oz. budget traveler double-wall insulation mug with a slider lid. Measures 3 7/16" dia x 6 1/2" h x 5" w. BPA free. Made in the USA. 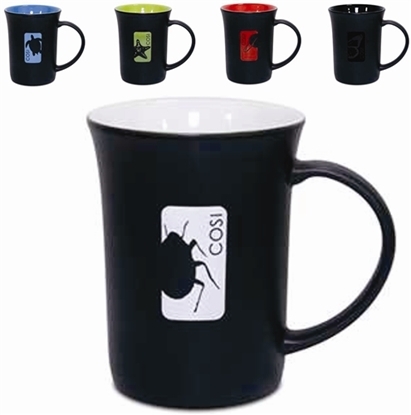 This budget traveler mug with slider lid is the perfect choice for your car, home, office or outdoors! 16 oz. traveler mug.Features double-wall insulation and a thumb-slide lid. Measures 3 7/16" diameter x 6 1/2" h x 5" w. Made in the USA, BPA free. Say cheers to a successful ad campaign when you include this 16 oz. 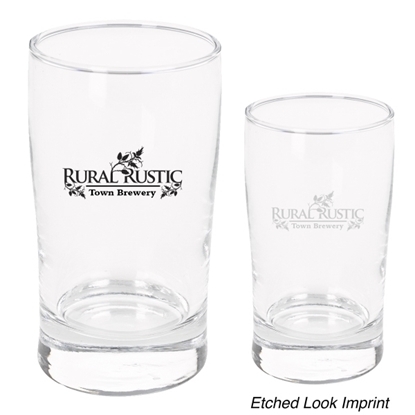 Classic Ale Pint Glass to your promotional package! It's a great glass for gatherings with friends, whether you're celebrating with a party, just hanging out at the bar or getting together for a work function with coworkers. The 5 3/4" H glass item can be customized with your company's name, logo or advertising message to spread your branding message near and far as everyone enjoys the occasion! 11 oz. marble ironstone mug. This ironstone mug features a marbleized finish, glossy exterior/interior and a large C-shape handle. Measuring 3 1/4" dia x 4" h x 4 3/4" w, this mug reaches its 11 oz. capacity when filled to the rim. 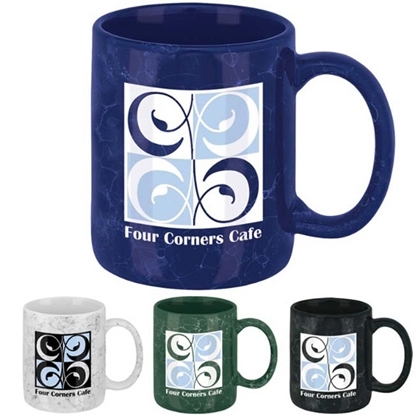 The marble effect will vary from mug to mug and may distort the logo appearance. 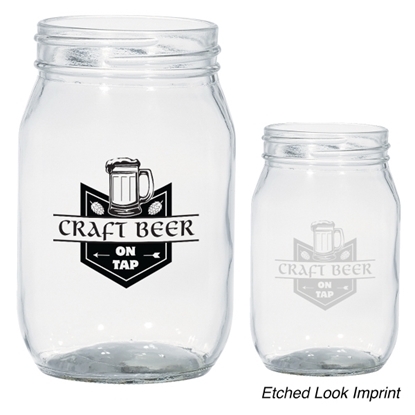 Expand the reach of your business when you hand out this beautiful craft beer glass! It's a mason jar that holds up to 8 ounces of your favorite brew. Stock up on this if you own a brewery or are running a restaurant. Customers who receive their drinks from this will certainly remember you. Your impact is made even more special after imprinting this with a silkscreen of your logo. Don't hesitate - order today! Enjoy the modern styling of this attractive mug with just a subtle hint of color! 14 oz. two-tone bistro mug. Features a color-coordinated base and halo, glossy exterior/interior and a large C-handle. Measures 3 9/16" dia x 5 1/8" w x 4"h, and it reaches its 14 oz. capacity when filled to the rim. Good value. Product may vary due to hand-painted design technique. 12 oz. contemporary mug with a glossy exterior/interior. Measures 3 3/4" dia x 4" h x 5 1/4" w and reaches its 12 oz. capacity when filled to the rim. Get a conversation going when you hand out this craft beer tasting glass! 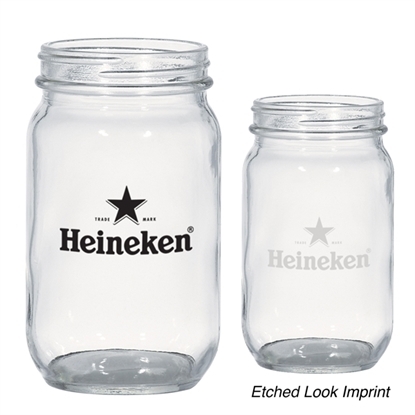 This clear jar holds up to 4 ounces and is great to add to the inventory of any bar or restaurant. It adds character and may even fit in with the decor. All that's left for you to do is add your company name or logo to the side with our silkscreen imprinting method. This is your way to associate your name with high quality products and a great customer experience! 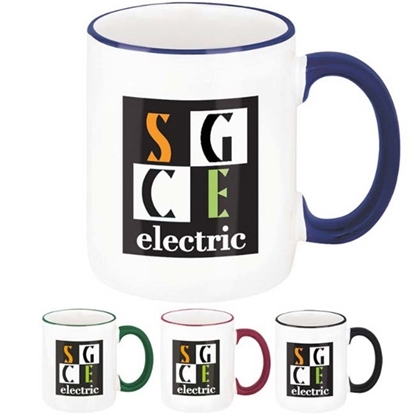 The metro mug is available in earth tones nd provides a good area for any logo or name. 14 oz. metro mug with a glossy exterior/interior. Measuring 3 13/16" dia x 3 9/16" h x 5 1/2" w, this giveaway reaches its 14 oz. capacity when filled to the rim. The 14 oz. 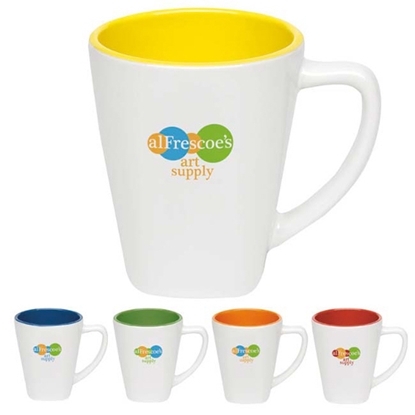 Sausalito mug is a bright, fun additiona to any desktop with a glossy exterior/interior. Measures 5 1/4" w x 4 1/2" h x 3 5/8" dia, it reaches its 14 oz. capacity when filled to the rim. Raise a toast to a successful promotional campaign thanks to this 5 oz. craft beer taster glass! This handy drinking glass is ideal for bars, restaurants and breweries for serving flights or dolling out samples of their delicious beer. Made in the USA. For maximum brand exposure, included a silkscreened imprint of your company name and logo, message and more. Your brand will be sipping to success in no time! 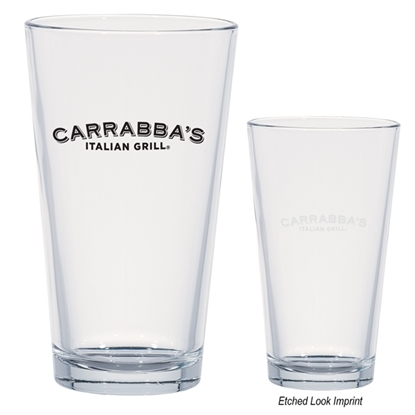 Ensure a fantastic customer experience when you hand out this craft beer glass! 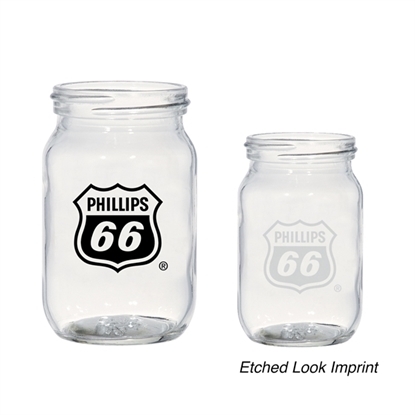 This clear jar holds up to 16 ounces and is great to add to the inventory of any bar or restaurant. It could fit in with your decor and add some character. All that's left for you to do is add your company name or logo to the side with our silkscreen imprinting method. When people get a hold of this, they'll never want to let it go! 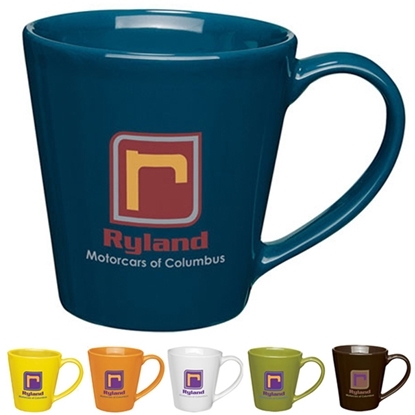 Add a bit of color to your potential clients' mornings with this Full Color Ceramic C Handle Mug! 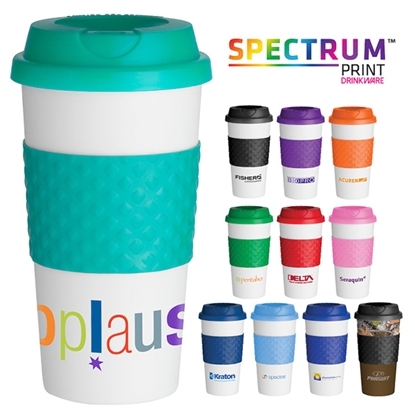 A one to full color SimpliColor imprint of your company name, logo or advertising message can be applied with virtually unlimited color options as a wrap on this 11 oz. white ceramic cup. 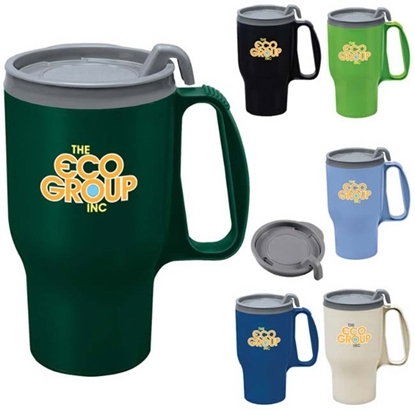 It has a handle, so recipients will be able to get a grip on your brand's offerings easily. Passes FDA testing and is dishwasher/microwave safe* for non-commercial use only. (*Not recommended for dishwasher use in Canada.) Help your business become a household name! 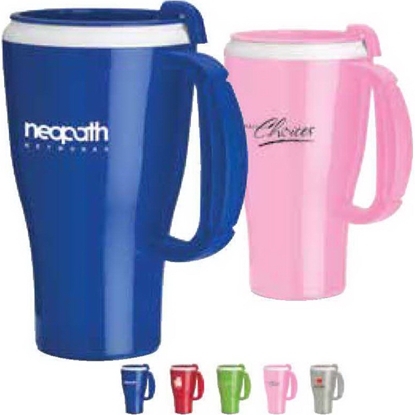 This double wall insulated travel mug is perfect for any promotion! The large four finger handle allows easy operation of the 2 piece, snap-on thumb-slide lid. 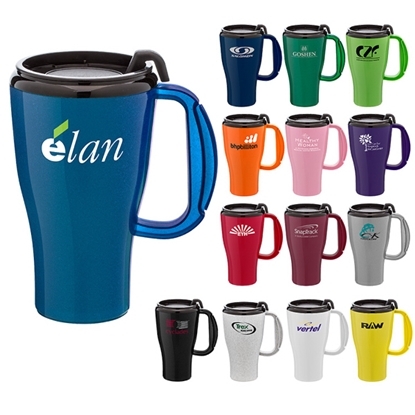 This item is perfect for golf events, company giveaways, or just a day out and about! 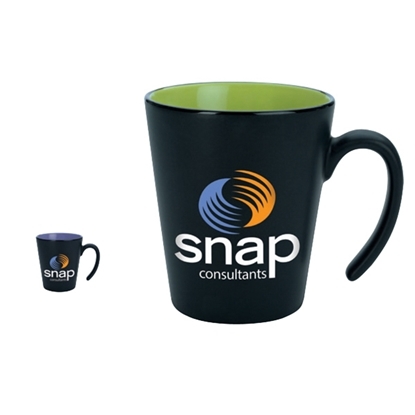 This mug is the staple of the promotional products and barware Industry. 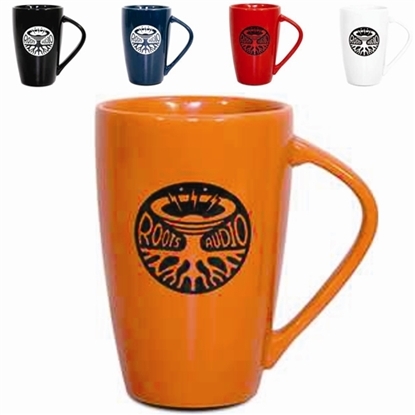 The coffee mug is perfect for the beach, sporting events, tailgates, weddings, festivals, giveaways, and social activities! A durable, eco-friendly, fun, tumbler that will be taken home and reused. American made, this is perfect for any school, golf, real estate, or healthcare promotion! This drinkware is great to just keep around the house or in the car as an automotive cup. 14 oz. two-tone square mug! Features a white glossy exterior and colored glossy interior. This ironstone ceramic mug measures 3 11/16" dia x 4 1/2" h x 5" w and it reaches its 14 oz. capacity when filled to the rim. Share your message on this uniquely shaped mug with a color pop interior. 14 oz. magnum mug with an extra-large handle and a glossy exterior/interior appeals to serious coffee or tea drinkers. It measures 3 3/8" dia x 4 11/16" h x 5" w, and it reaches its 14 oz. capacity when filled to the rim. 13 oz. contrast mug! 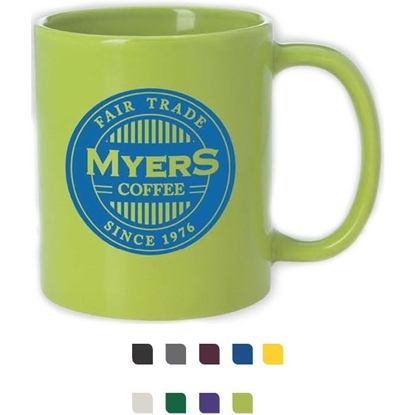 Add a splash of color to your morning cup of joe. Features a matte finish exterior, glossy colorful interior and open handle. Measuring 3 5/8" dia x 4 1/4" h x 5" w, it reaches its 13 oz. capacity when filled to the rim. Good value. 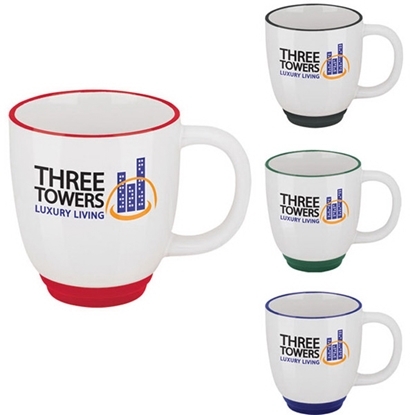 Mypromotionalpens.com offers the largest and best priced selection in Promotional Mugs. We will price compete and we won't be under sold. 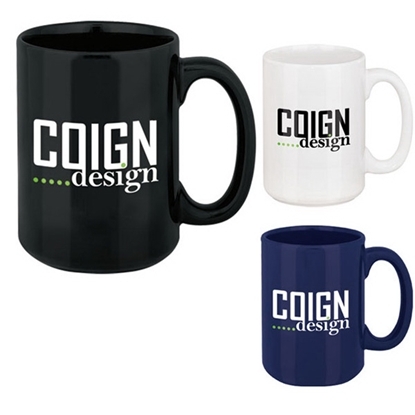 Let our graphic designers make your personalized Mugs standout above the crowd at no charge. 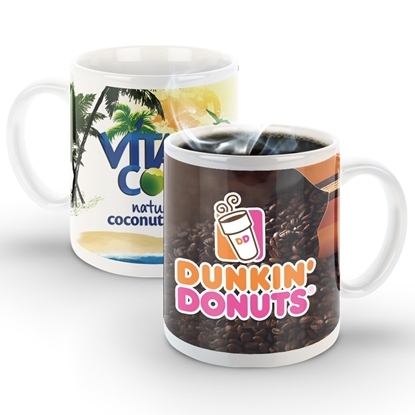 We won't stop until you are completely satisfied with your custom Mugs art proof.Use category search filters on your left to help narrow your search to find exactly what you are looking for.